Meet Alex Henderson, who built an online paddle-boarding retail business as one of the 600 children to complete the Lemonade Stand course across the country. 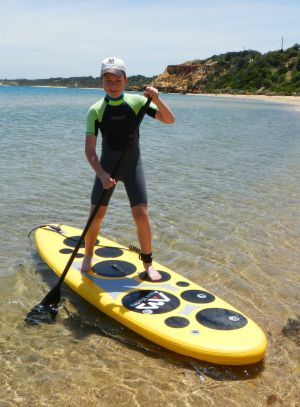 After attending Lemonade Stand, Alex was empowered with the knowledge and skills he needed to create an online paddle boarding business with his father, Watercooledsup.com.au. Alex believes his points of difference - price competitive products, as well as offering advice and reviews to the paddle boarding community, will set him apart from the competition. “I used to think that I couldn’t do anything (business-related) until I was 18 years-old but Lemonade Stand opened my eyes to the tools and opportunities available to kids my age." Through implementing the lessons learnt about validating his business idea and targeting the optimal customers for his product, Alex's business has nearly broken even within his first four weeks of launching. When asked to project his future, Alex sees himself in the health industry, while running multiple businesses in the background. “In 12 months I have full confidence the business will be growing and even quite big by that time. My advice to other kids is that there are challenges but you can do it, especially with a bit of money, the internet and a laptop." Alex Henderson is an enterprising young surfer with big potential. The student of Melbourne's Oakleigh South Primary School student believes he'll succeed because his marketing includes a growing library of video reviews published on YouTube made with his father. He's also selling his products at a cheaper price point. Want your kids to get involved? Our Lemonade Stand programs are available for 9 - 11 year olds in Melbourne, Sydney and Brisbane. Classes for the upcoming holidays are consistently sold out so make sure to secure your spot right away. Watch your kids build their own startups and dreams! Unlock your child's imagination and help them create the future. Help your kids learn one of the most valuable, sought-after skill of the 21st century. Thanks for sending us your details! The Lemonade Stand team is currently on break and will be back on the 9th. If you'd like to contact us directly, please use the Contact Form. Thanks for understanding! Have a good holiday!